The world could use Winston Churchill right now, but since he’s been dead 50 years a decent biopic will have to do. And “Darkest Hour” is a decent biopic, rousing and well-made and unruffled by depth, with an expertly judged performance at its center. It makes no sense to throw a great ham at the role, since Churchill was already an outsize figure and ready-made cartoon. A finesse artist like Gary Oldman, on the other hand, can bring the British icon down to life-size and then build him back up with freshly observed details. 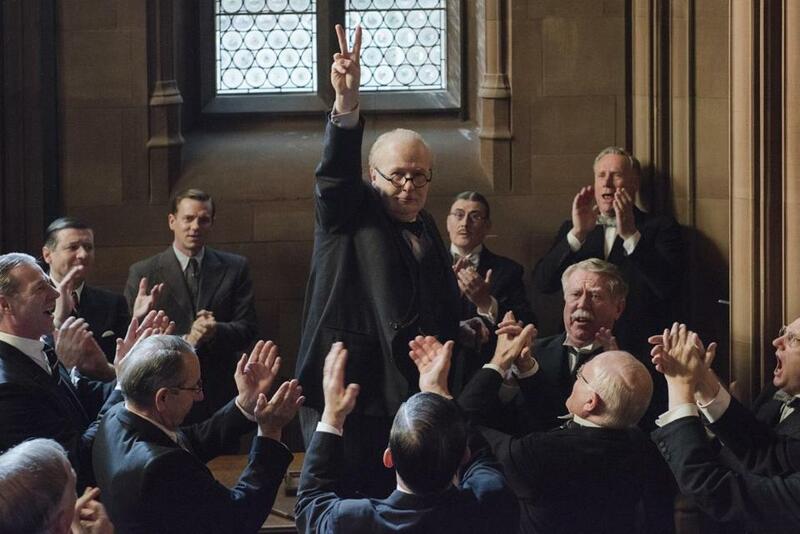 Such recent Winstons as John Lithgow (in TV’s “The Crown”) and Brian Cox in this year’s dreadful “Churchill” (buyer beware) have howled their lines to the back seats, while Oldman’s Churchill mutters and warbles and thinks half out loud. You have to lean in. Watching him is great fun, and Oldman knows it; he knows Winston saw the fun in himself, too. Everything outside the performance is the opposite of fun, of course. “Darkest Hour” takes place in May 1940, as Hitler’s army is racing across France and Belgium toward the Channel; the appeasement government of Neville Chamberlain has fallen and, to the shock of many, Churchill is voted in as prime minister. Through dialogue and expositional sleight of hand, director Joe Wright lets us see his hero as 1940 England saw him: intemperate, passionate, a privileged toff with an eccentric common touch. Churchill still has the stench of one of WWI’s worst military disasters for the Allied powers — the battle of Gallipoli — clinging to him, but while everyone else in government is desperate to avoid a second Great War and desires a deal, any deal, with Germany, Churchill insists that Hitler must be fought. He was right, obviously, but “Darkest Hour” vividly re-creates the weeks when he seemed to be the only person who thought so. The film moves between the Houses of Parliament, 10 Downing Street, and Churchill’s War Rooms in the cramped, bomb-proof quarters below Westminster. Wright is a director of prodigal talents and visual bravura, which has served some of his movies well (“Pride and Prejudice,” “Atonement”) and some less so (“Hanna,” “Pan”). “Darkest Hour” finds him back in his comfort zone of rip-roaring period filmmaking, with camerawork and editing and production design of aggressive elegance. Instead, the action in “Darkest Hour” concerns Churchill’s scramble to shore up support in government, abroad, and among the British people for the conflict he knows is coming. His fellow politicians don’t trust him — Wright has a deep bench of supporting players like Stephen Dillane, Samuel West, and Ronald Pickup to play the ruling elite arrayed against Winston — and President Roosevelt is a friendly voice promising nothing at the end of a phone line. The personal relationships are more telling. Wife Clementine Churchill can be a thankless role, but Kristin Scott Thomas is an excellent casting choice, her angular asperity and inner warmth playing perfectly against Oldman’s bulk and bellowing. Lily James (“Downton Abbey”) plays the young private secretary to the great man, untested at first but growing in confidence, and the movie has a stealth weapon in Ben Mendelsohn’s King George VI. The Australian actor tends to play tense, violent men, but his Bertie Windsor is a welcome change — a constrained and deeply cautious man who slowly learns to value this bull in his country’s china shop. “Darkest Hour” is good, glib entertainment, and, honestly, it’s what you want at the holiday season, a movie bold enough to lure you into the theater but not one to tax the brain with any message beyond Get Mad and Carry On. Oldman hides his switchblade body beneath many layers of padding, but he gives us a new kind of Churchill (or enough of one), with sharp blue eyes hiding behind layers of entitlement and bluster. The bluster fools everyone; the eyes see everything. Anthony McCarten wrote the script and it’s shamelessly enjoyable while only once stooping to the simply shameless: when Churchill descends into the London Tube to go directly to the people for their opinion on whether England should cave in to the Nazi threat. This never happened, but similar events apparently did, which allows Wright to flood the moment with a sentimentality that even Dickens might have winced at. Do you feel played? Yes. Does the scene still work? Absolutely. “Darkest Hour” is comfort food for an era that needs reminding what great men looked and sounded like. Directed by Joe Wright. Written by Anthony McCarten. Starring Gary Oldman, Kristin Scott Thomas, Ben Mendelsohn, Lily James. At Kendall Square. 125 minutes. PG-13 (thematic material).